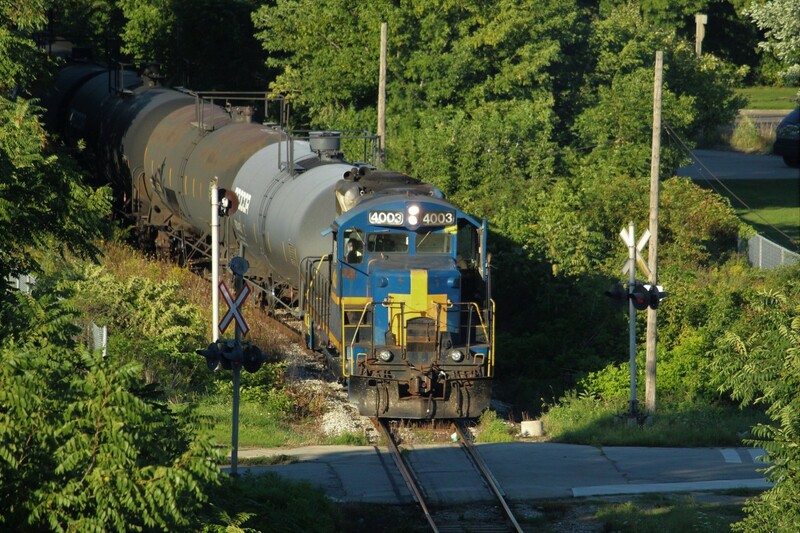 Railpictures.ca - James Knott Photo: Typically when you catch a train at this crossing at Simcoe Street in Hamilton (mile 0.24 of the N&NW Spur), they’re done working and on their way back to Stuart. However, in what was a first for me, 4003 is actually still working in this shot, switching either Vopak or Bunge (not sure which at this point) about a half-mile away. I believe they had to come out this far to clear a switch. | Railpictures.ca – Canadian Railway Photography – photographie ferroviaire Canadienne. Caption: Typically when you catch a train at this crossing at Simcoe Street in Hamilton (mile 0.24 of the N&NW Spur), they're done working and on their way back to Stuart. However, in what was a first for me, 4003 is actually still working in this shot, switching either Vopak or Bunge (not sure which at this point) about a half-mile away. I believe they had to come out this far to clear a switch.